A walker dodges tall waves at Sandymount strand in Dublin yesterday. Photo: Justin Farrelly. Dublin City Council drainage services workers close off car parks and lay sand bags along Sandymount yesterday. Photo: Fergal Phillips. The weather front heading towards Ireland. Gale force winds will sweep into the country today, bringing a potent mix of thunder and wintry showers. Those living in coastal areas have been warned to be on high alert, with the hope that high tides and swells will not bring a repeat of last February's devastating floods. An orange alert weather warning remains in place for today, as winds gusting up to 130kmh will continue to batter the north and west coast. Clare County Council even issued its own weather warning for homeowners whose properties flooded last year, asking them to take extra precautions. 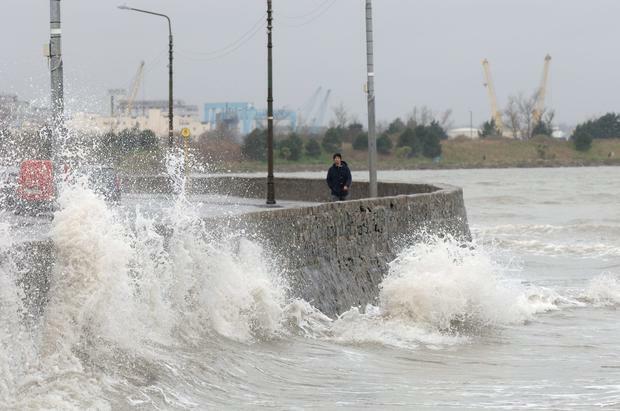 Dublin City Council has also activated flood defences in some parts of the capital due to the expected high tides. But Met Éireann says nowhere will escape the weather that's set to batter the country. It is being caused by an area of low pressure that's moving between Iceland and Scotland, causing temperatures to plunge. Forecaster Pat Clarke said the next 24 hours would bring a combination of different weather types - most of them unpleasant. These will include heavy showers of rain, hail and sleet. Homeowners who had just got over the devastating floods of last winter will be watching for high seas along the Atlantic seaboard, combined with high tides and swell, bringing the very real threat of more flooding. The threat of coastal flooding will peak this morning and later this evening when high tides are expected. A weather warning issued by Clare County Council yesterday remains in place until tomorrow morning. The local authority is advising the public and those with properties that have previously flooded on the coast to be aware of this risk. Met Éireann says the strong winds will coincide with high seas along Atlantic coasts, which may lead to some coastal flooding. Southwesterly winds will reach mean speeds of 65kmh to 80kmh, while gusts of 110kmh to 130kmh are possible, with exposed coasts and higher ground most at risk. Winds will veer westerly this afternoon, eventually easing off tomorrow morning. "An area of low pressure is moving between Iceland and Scotland that will bring in stronger winds and even colder conditions over us," Mr Clarke warned. "It will also be showery with high seas along our Atlantic seaboard. "There will be a combination of different weather but mostly bad weather, with heavy showers of rain, hail and sleet, particularly in the north and west. "There could be a light dusting in other areas too. "There will be some lulls now and again but overall, conditions will be extremely windy with gales and strong gales and maybe even storm force gales across the west and north coast. "The west and north will get the worst of the winds and the seas will be highest along the west and north coast," he added. And although the worst of the storm will have passed by tomorrow, the weather will remain very unsettled for the rest of the week. Tomorrow will be very cold and windy but bright, with sunny spells and a fresh to strong west to north-west wind will gradually ease. Maximum temperatures will only reach between 5C and 8C. Wednesday will feel much milder, with temperatures reaching up to 12C but heavy rain is forecast for that night, clearing by morning but turning very cold again. It will remain cold on Thursday when there will be sunny spells and occasional showers, mainly of rain and hail with a risk of thunder. Friday will still be cold with some sunny spells but the early indications for the weekend are for milder weather but wet and windy at times.